Stonburner has been named the morning-line favorite in the sixth running of the $44.800 2018 Speed Sale Futurity Saturday at Indiana Grand Racing & Casino. SHELBYVILLE, IN—SEPTEMBER 13, 2018—Stoneburner, the talented two-year-old from the Randy Smith Stable, has been tagged as the favorite in the sixth running of the $44.800 2018 Speed Sale Futurity Saturday. The race is slated as the seventh on the eight-race all-Quarter Horse racing program at Indiana Grand, marking the fourth night dedicated to sprinters during the 2018 racing season. Stoneburner and Jose Beltran will start from post six at odds of 2-5. The Brimmstone gelding has three wins in four starts this season for owner Gerald Keesling. Indiana Grand’s all-time leading Quarter Horse trainer and current leader in 2018, Smith, conditions the speedy youngster. Stoneburner will see a strong opponent to his outside in Jesslikethat and Luis Guerrero. The chestnut daughter of One Sweet Jess was a winner in her last start for Shelly and Chris Burke. John McCreary trains Jesslikethat, who begins from post eight in the nine-horse lineup at odds of 6-1. Regal Beach (Sammy Mendez, 30-1). Estimated post time for the Speed Sale Futurity is 8:53 p.m. The Quarter Horse card also includes two trials for the Sterlie Bertram Memorial in races five and six. The top 10 will return for the $100,000 final set for Saturday, Sept. 29. 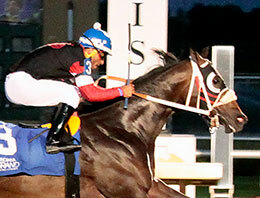 The 16th season of Thoroughbreds and Quarter Horse racing continues through Wednesday, Nov. 7. Racing is conducted Tuesday, Wednesday and Friday at 2:05 p.m. with Saturday racing beginning at 6:05 p.m.
Arthur James Andrus "T-Booy" with WH Design By Dash and HH Kentucky Krome.